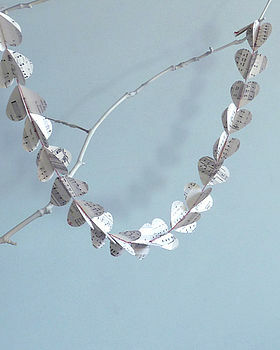 If you love all things vintage, then you'll love this adorable heart garland! Perfect strung from the ceiling, along your mantle or along your table this pretty string of hearts wiil add a touch of vintage charm to your celebrations! Handmade from two layers of individual hearts, cut from vintage music scores and then lovingly stitched together with red thread, you can leave them flat or fold out for a 3D effect. Buying Handmade: Due to the handmade nature of this product it may vary slightly from the image, this is all part of its unique charm!